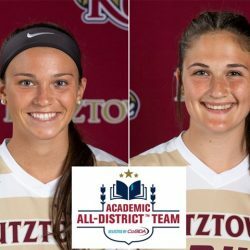 KUTZTOWN, Pa. – Juniors Kristina Miller and Emily Zwiercan of the 18th-ranked Kutztown University women’s soccer team were recognized on the College Sports Information Directors of America (CoSida) 2018 Academic All-District First Team, released on Nov. 8. The Academic All-District and Academic All-America teams recognize student-athletes for athletic and academic achievements and are nominated and voted on by members of CoSIDA. District 2 of Division II follows the NCAA’s regional model and includes all schools from the PSAC, Mountain East Conference and CIAA (Central Intercollegiate Athletic Association). It is the second Academic All-District honor for Zwiercan and first for Miller. Miller, a junior captain, holds a 3.98 GPA in business administration and political science. The defender was voted an All-PSAC First-Teamer, and has started all 19 games this season, and each of the last 40 games within the last two seasons, in the center of the KU defense. She has scored a career-high three goals this season. The Lansdale native is the rock of a KU defense that has allowed just nine goals this season, which would rank as the least in a season in program history, with at least one more game to be played in the NCAA Tournament. Zwiercan holds a 3.75 GPA in business administration. The junior forward, the 2017 PSAC Athlete of the Year, was voted to the First Team for the second straight season this season. She has started all 19 games this season and has totaled 11 goals, fourth in the PSAC. She is also in the top-six in points with 25 (11 goals, three assists). The Reinholds native ranks fourth all-time at KU in career goals (30) and assists (18), and is tied for second with 78 career points. Zwiercan’s postseason honors from last season include D2CCA All-America Third Team, D2CCA Atlantic Region Player of the Year, All-Atlantic Region First Team and the 2018 KU Female Athlete of the Year. Miller and Zwiercan will now be eligible for Academic All-America consideration, with honorees announced in early December.